$2000.00 is good price wise because of what you get, and I concur that it's well worth it. I imagine they'll come down more in the next few years because of companies like FCC. I'm with Brad on the pros and cons, but eventually FCC should be better all around. They should focus on places Systema flopped, or where mediocre first. Mastering that is what guys like MacGuyver and myself have been waiting for. Its too bad you didn't get to come down to Calgary Mac, I'd have loved to see you pick FCC's brain. I have my own opinions and experiences as being a long time Systema owner, heavy heavy user, and doctor; but I still defer to Mac as the foremost expert. The cost of the new FTW is priced very competitively when compared to a similarly equiped PTW, the prototype minus the ambi selector will be available for review, which will be posted here as soon as its finished, from what I've seen the color is not as fine as the finished products but the guts and internals are great. initial firing test is great just waiting for the prototype to arrive to complete some field testing before the final QC is finished and products is launched. FCC Valued their customer opinions and comments whether its bad or good, they actually encourage their customer to give them the opinions and comments, for FCC the comments and end user feedback is very important to help them further improve their products. What I would like to know what are the fps ratings on the FCC cyclenders and who has the better hop up FCC or DT. 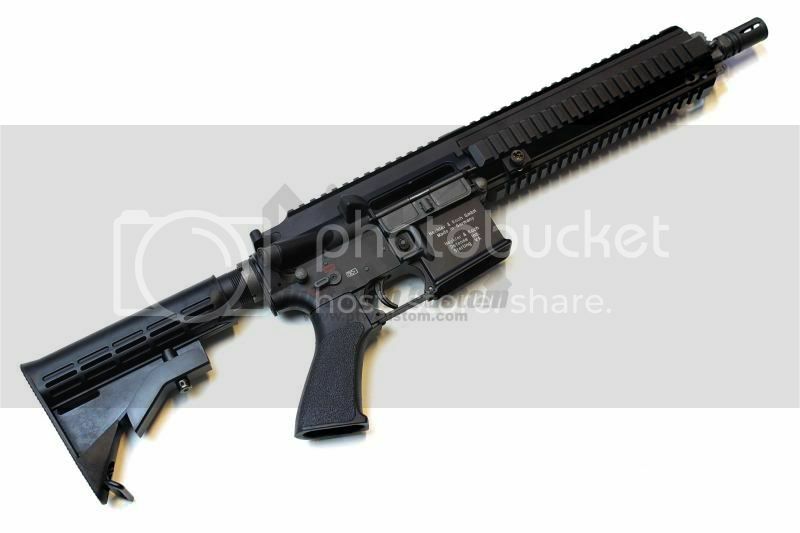 I would be greatful for the info also who is a FCC dealer here because would like to get a 416 compote upper. The FCC hopup uses a square spring, and a factory Systema as well as a modified hopup use hard silicone rubber cushions. The spring is going to be more linear, however is not as strong as the cushions. The cushions are vastly more affected by temperature snd stiffen up when cold, something the spring doesn't do. A strong spring is required to apply maximum pressure from the adjuster onto the BB. A modified hopup uses a 3MM adjuster while the FCC is 2MM as well as the 2012 factory adjuster. It is fine, but the larger adjuster will form around the top of the BB once it is bedded in. I personally prefer a modified hopup, but would like to replace the cushions with a stronger spring. FCC has the right idea, but the spring strength needs to increase by a large amount, something I am not sure can be done with the existing design of the adjuster cage. This is probably the reason why rubber cushions have been used for so many years and through all design changes. DTT is the only official dealer in Canada for now, Chris is a great guy to deal with. Would you happen to know if the 2013 FTW's are able to use PTW Pmags? I ask because I understand that the FCC 416's have fitment issues using the PTW Pmags. The FCC416D does have issue with the PMags, but the new M3 mags will fit. I have to wait till the Prototype arrive before I can confirm, but according to FCC they are made to fit with every mag I will confirm this when the FTW arrive sometime this week. So in the end its still economical to the general population to get the FCC. much like some players here who have owned multiple PTW I was one of teh doubters of this company I can't believe that a small company from HK can fix the issues that a large company like Systema have failed to acknowledge or fixed but the quality of some o ftheir parts and the result won me over to the point where I ditch almost all of my PTW for their custom build model, even the one Tony build with all the Prime body sexiness. Like Brad said in teh earlier post BNIB sometimes are not BNIB unless you know the owner personally. Not to play a critical Noob here but....What If I didnt need any of that stuff? I understand the hop up mod, but I dont need rails and an aftermarket body or anything like that. I know I need Batteries,Mags,Cylinders for a Systema Startup which to me takes precedence over those other things. I may be just one out of many who decide to go the other route, but I never really liked "blinging" out my gun lol. I bought a Rail for my RS Type 97 but left it off and preferred to use my Iron Sights, Same thing for my RS Type56 Though I had some work done to the Mechbox. Im not biased towards either gun, but The feel and performance would definately get me. Look interesting, Once I have more break from my recent open restaurant. I will have to grab one or two of those. Honestly, I used to be Systema fan but be able to buy a product come with a good warranty, great communication and great product from the start would save me time on the mod and spend more on the field. The same thing apply to real steel product, once I start to spend more than 2k, I expect the manufacture will take care their warranty and start to improve their product, it's not really a cheap toy. Lol better hope you don't have a break for at least two to three years otherwise you are in trouble. Keep an eye out for some new arrival announcement either here or on the FCC Canada facebook. Nah ! not really, I still love airsoft but my schedule is very tight, being a chef yourself, you should how hard to take a break and the worst is when you owe the restaurant yourself. I stop counting my hour once I start it. Real steel is quite adorable, the range only 10 minutes from my place so always have one of two hours to drop by. Anyway, the great thing about FCC is be able to fix the problem right from the start, listen to their customer, honor their product and warranty. That's the great way of starting business from the start whereas systema just simply take our money and quite but I have respect for them to be the mother company, still again it's not a cheap toy to be left miserable when you try to source their new parts to replace the broken one. Sorry for my rant. I must be drinking too much Guru. Amen to that, its hennesy for me after some crazy nights which seems to be very often these days. Please stop teasing me. I'm going to hate you soon.